Bognor boss Jack Pearce says he is unworried about the Rocks’ recent run of five games. The streak of three draws and two defeats has put a slight dampener on what has been a bright start to life back in the Isthmian Premier for the Nyewood Lane side. Two of those matches came in the last week, as Bognor took two matches and a penalty shootout to overcome Isthmian One South Central side Bracknell Town in the FA Trophy. Their reward is a trip to Southern League South side Walton Casuals next week (November 10) in the next round of the national knockout competition. Before then, Bognor return to league action, heading to struggling Leatherhead tomorrow (3pm), and then hosting SCFL Division One side Seaford Town in the Sussex Senior Cup on Tuesday (7.45pm). But, despite the poor run, the Rocks boss said he was happy with the performances that his young side continued to produce. Pearce said: “In both games we should have comfortably put the game to bed, there’s no doubt about that. But our finishing is not great at the moment and we are not defending very well. But between the two penalty areas we are ever so pleased with the lads. Rocks highlighted their wasteful nature in front of goal during the two matches against Bracknell. 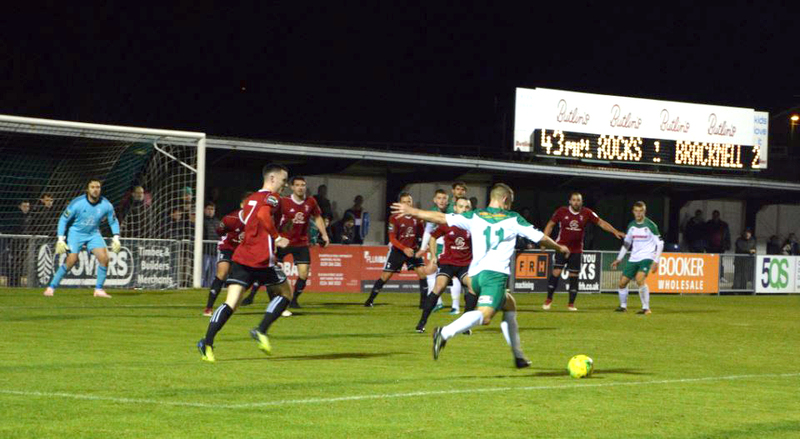 While their opponents took their chances, Bognor spurned plenty and had to rely on a late Brad Lethbridge goal to seal a 2-2 draw in the first encounter. In the replay, Rocks fought from two down with Calvin Davies and a late Jimmy Wild effort levelling things up. It was then over to Dan Lincoln to save three penalties to secure a 3-2 win on spot kicks. If there was a bright spot, it was the performance of Mason Walsh who took the man of the match award during the replay. Next for the fifth-placed Rocks is a trip to third-bottom Leatherhead to face a side who have struggled for goals more than Bognor in recent weeks – with their tally of eight the lowest in the division.